Background: Acute Coronary Syndrome (ACS) is increasing in Yemen in recent years and there are no data available on its short and long-term outcome. We evaluated the clinical pictures, management, in-hospital, and long-term outcomes of the ACS patients in Yemen. Design and Setting: A 9-month prospective, multi-center study conducted in 26 hospitals from 9 governorates. The study included 30-day and 1-year mortality follow-up. Patients and Methods: One thousand seven hundred and sixty one patients with ACS were collected prospectively during the 9-month period. Patients with ST-elevation myocardial infarction (STEMI) and non-ST-elevation acute coronary syndrome (NSTEACS), including non-ST-elevation myocardial infarction and unstable angina were included . Conclusions: ACS patients in Yemen present at a relatively young age with high prevalence of Smoking, khat chewing and hypertension. STEMI patients present late, and their acute management is poor. In-hospital evidence-based medication rates are high, but coronary revascularization procedures were very low. In-hospital mortality was high and long-term mortality rates increased two folds compared with the in-hospital mortality. There are limited data on the presentation, management, and outcome of ACS admissions in Yemen. The Gulf Registry of ACS will highlight on this data in Yemen as part of the whole data from the Gulf countries. Gulf RACE is the largest multinational prospective ACS registry in the Middle East. Data from Yemen was collected from 26 Hospitals in 9 governorates and 1761 ACS patients were enrolled. Baseline characteristics, management, in-hospital mortality and long-term outcome of the Yemeni patients are described. Mortality among Yemeni patients in Gulf Registry of ACS (Gulf Race-1) was the highest among the Gulf states. Many factors play a role in this mortality are a non-present and khat chewing are two important factors. Khat chewing is an independent risk-factor for acute myocardial infarction in Yemen. It causes coronary and peripheral vasoconstriction  and associated with increased risk of stroke and death in patients with ACS. Khat is associated with high morbidity, in-hospital mortality and late mortality. Another explanation for high mortality is the lack of ambulance service. The data were collected from a 9-month prospective, multi-center study in Yemen as part of Gulf RACE-2. ACS patients were recruited consecutively from 26 hospitals from 9 different governorates in Yemen with a diagnosis of ACS including ST-elevation myocardial infarction (STEMI), unstable angina (UA) and non-ST-elevation myocardial infarction (NSTEMI). The last two diagnosis have been merged together as non-ST-elevation acute coronary syndrome (NSTEACS). Data on the following variables were collected: Serum creatinine before hospital discharge, serum hemoglobin A1c; EF by echocardiography (severe left ventricular (LV) dysfunction, Ejection fraction (EF) <30%; moderate LV dysfunction: EF = 30-40%; mild LV dysfunction: EF = 40-55%; normal LV function: >55%). Coronary angiogram results (left main CAD, one-vessel disease, two-vessel disease, triple-vessel disease); and types of coronary artery stents used (drug-eluting and/or bare-metal stents). Significant CAD was defined as ≥50% occlusion compared to the normal reference diameter in the left main and ≥70% in other major epicardial coronary arteries. A report form for each patient with suspected ACS was filled out upon hospital admission by assigned physicians and/or research assistants working in each hospital using standard definitions and completed throughout the patient's hospital stay. Almost all the data variables were mandatory fields and completed online. All report forms were verified by a cardiologist and then sent online to the principal coordinating center, where they were further checked for errors before submission for final analysis. We avoided duplicate admissions to the registry by using patients' national identification numbers and assigned "registry numbers." Long-term mortality was obtained by either phone contacts or clinic visits. Data were summarized as mean ± Standard Deviation (SD) if they were normally distributed; otherwise, they were summarized as the median and interquartile range (IQR). Differences between groups were assessed using Chi square or Fisher's exact tests for categorical variables, student's t tests for continuous and normally distributed variables, and the Mann-Whitney U test for skewed variables. All analyses were considered significant at P < 0.05. The analysis was performed using SPSS software, version 18. Between October 2008 and June 2009, 1761 ACS patients were enrolled. There were 1230 (69.8%) STEMI and 531 (30.2%) NSTEACS patients. The NSTEACS patients included 246 (46.3%) NSTEMI and 285 (53.6%) UA patients. [Table 1] shows patient's baseline characteristics and treatments. The mean age of the overall population was 58 ± 12 years, 79.2% of them were men. The prevalence of CAD risk-factors was high, in particular khat chewing and smoking; 77.1% were khat chewers and 72.1% were either current or ex-smokers. Followed by hypertension in 34.6% of the patients, diabetes mellitus in 23.2% of patients and 13.2% had hyperlipidemia. Mean body mass index (BMI) ± SD was 25.3 ± 4.3 kg/m 2. Upon presentation, only 1.8% arrived at the hospital in an ambulance, 81.4% had typical ischemic chest pain, 8.3% had clinical evidence of congestive heart failure (CHF), and 77.1% had positive serum troponin. Serum troponin was unknown in 132(7.5%) patients as the treating physicians decided not to perform the test because the diagnosis of STEMI had already been made by electrocardiogram and elevated creatinine kinase isoenzyme (CK)-MB, or the test was not available at the time of admission. Compared with STEMI patients, those with NSTEACS were more likely to be older and to have history of Percutaneous coronary intervention (PCI), coronary artery bypass graft surgery (CABG), peripheral arterial disease, CHF, ex-smoking, to present with Killip class >1, higher mean systolic blood pressure; higher frequency of intermediate Global Registry of Acute Coronary Events (GRACE) score category, to have severe LV dysfunction, undergo coronary angiogram, PCI, CABG. However, STEMI patients were more likely to be men, had a higher BMI, and to present with typical ischemic chest pain, current smokers, khat chewers, hyperlipidemia, positive serum troponin, higher peak serum CK-MB fraction, total cholesterol and triglyceride, and/or left main and/or triple-vessel disease during hospitalization and low GRACE score category. Five hundred and sixty nine patients (46.2%) out of 1230 STEMI patients presented within 12 h of symptom onset; Median time from symptom onset to hospital arrival 440 min (IQR: 195-900 min). Only 337 patients (19.1%) out of 1761 patients were treated with thrombolytic therapy (TT), with only 27% (90 patients out of 337) receiving it within less than 30 min and the median door-to-needle time was 40 min (IQR 25-60 min). The most commonly used TT was streptokinase (96%), followed by reteplase (2.7%), then tenecteplase (0.9%). These drugs were administered in coronary/intensive care units in 94.1%, and by cardiology specialists in 82.5% of cases. There was no clinical evidence of reperfusion in 22.3%, and rescue PCI was done in 0.2% of these patients. Reasons for not administering TT included: symptom onset more than 12 h before hospital presentation in (85%) of the patients, missed diagnosis in (3.9%), absolute contraindications (2.7%) and primary PCI (1%) and other causes (7.4%) such as unavailability of unavailability of TT, patient and/or family refusal, and patient inability to pay for cardiac care. There was a high use of evidence-based medications in the first 24 h of hospital admission and at discharge: Aspirin (98.2% and 89.2%), Statins (93.6% and 87.4%), Clopidogrel (88.6% and 82.1%), Beta-blockers (63.4% and 67.1%), and angiotensin-converting enzyme inhibitors or angiotensin receptor blockers (74.5% and 73.6%). Anticoagulation therapy, was given to the patients was in the form of intravenous unfractionated heparin for 84.3%, and enoxaparin 9.5%. No single STEMI case received bivalirudin or fondaparinux. Intravenous glycoprotein IIb/IIIa inhibitors (GP IIb/IIIa-I) were given in 2.3%, all of them in the form of tirofiban. 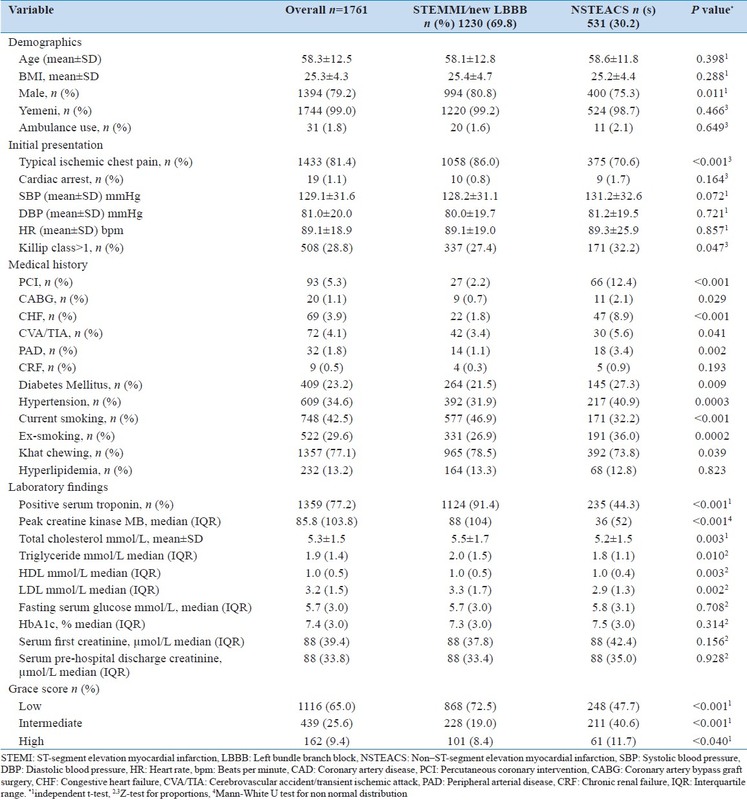 [Table 2] shows that Echocardiography was done in 81.3% of patients, with 76.1% having evidence of LV dysfunction. Coronary angiography in 11%, PCI in 4.4%, (more for NSTEMI than STEMI) and CABG in 0.1%. In PCI patients, bare-metal stents were used in 69.4%, drug-eluting stents in 27.8%, and both in 2.8%. [Table 3] shows the in-hospital and long-term outcome; The most frequent complications were recurrent ischemia (28%) and CHF (19.5%), whereas rates of stroke (1.1%) and major bleeding (0.7%) were very low. The overall in-hospital mortality was 8.6%; STEMI patients had higher in-hospital mortality and cardiovascular complications except for major bleeding and CHF but had similar rates of stroke compared with NSTEACS patients. STEMI patients had more recurrent ischemia, recurrent myocardial infarction, cardiogenic shock, ventricular tachycardia and/ventricular fibrillation and in-hospital mortality. Overall 30-day mortality was 14.9% (16.2% in STEMI, 12.1% in NSTEMI/UA, and unknown in 12%). Overall 1-year mortality was 17.4% (18.6% in STEMI, 14.7% in NSTEMI/UA, and unknown in 14.5%). This paper is the first one to describe the ACS presentation, management and long-term outcome in Yemen. It is part of the Gulf registry of ACS phase-2. It reflects the general practice and management strategies in many hospitals and different governorates in Yemen. The average age of ACS patients at presentation was 58 years, which is almost a decade younger than the presentation age in developed countries. STEMI prevalence among our patients can be explained by high prevalence of khat chewing, which was shown to be associated with more STEMI than NSTEMI,  overall younger age of population and the priority of admission to hospitals was for STEMI is another possible reason, while those with NSTEMI are transferred to other hospitals and some of these hospitals were not involved in this study. Patients with STEMI in our study took 440 min (IQR: 195-900) before presenting to the emergency department compared with 140-170 min in developed countries  and 178 min in the Gulf. This reflect the absence of ambulance services for transferring patients to hospitals, lack of knowledge of the heart attack symptoms and absence of hospitals with intensive care facilities in many governorates and long travel distances needed for patients before arrival to a major cardiac center in the country. Therefore, only 19% of the STEMI patients received TT and only 27% of these patients received TT within less than the standard 30 min door-to-needle time. The majority of patients were delayed in the emergency department awaiting the approval of administration of TT by the Cardiologist in the coronary/intensive care units. Our study shows that the most commonly used TT was streptokinase (96%), reteplase (2.7%), then tenectaplase (0.9%), the explanation of using the streptokinase in majority of cases is the availability of the drug and the low cost, while the other TT were very expensive and not available. Primary PCI in Yemen is very limited and represented in this study with only 1% despite the presence of two hospitals with PCI facilities. This low percent of using PCI could be explained by many factors including late presentation to ER, delay at ER, Lack of PCI facilities hospitals, STEMI team is not available in particular overnight duties. The results showed high use of guidelines recommended oral medications, which was similar to other registries. However, rates of medication like "fondaparinux," Bivalirudin, GP IIb/IIIa and rate of coronary angiogram, Primary PCI and CABG were much lower than those reported in developed and some middle east countries. Only one government hospital in the capital of Yemen has on-site cardiac catheterization at the time of this registry. Other two governorates have cath lab facilities but were not working on regular basis. This reflect the great need in establishing a tertiary care hospitals with coronary care unit (CCU) and cardiac catheterization facilities that could provide efficient care for patients with ACS. Society awareness, medical insurance and Ambulance services are needed as part of the overall medical care improvement in Yemen. The study did not cover the all hospitals in Yemen and does not reflect the clinical practice of all hospitals in the country. Many patients with NSTEMI referred to hospital were not involved in the study and therefore not included in the study. Finally we did not measure the factors that might explain the increase in long-term mortality such as non-adherence to medication. ACS patients in Yemen present at a relatively young age with high prevalence of smoking, khat chewing and hypertension. STEMI patients present late, and their acute management is poor. In-hospital evidence-based medication rates were high, but coronary revascularization procedures were very low. In-hospital mortality was high and long-term mortality rates increased two folds compared with in-hospital mortality with the highest mortality in STEMI rather than NSTEACS patients, despite the former being younger and having less cardiovascular co-morbidity. Further studies are needed to explore the underlying reasons for these findings. 1. Mendis S, Puska P, Norrving B. Global atlas on cardiovascular disease prevention and control. Available from: http://www.answers.com/topic/cardiovascular-disease#ixzz2HgXaHkPZ [Last accessed on 2011]. 2. Zubaid M, Rashed WA, Almahmeed W, Al-Lawati J, Sulaiman K, Al-Motarreb A, et al. Management and outcomes of Middle Eastern patients admitted with acute coronary syndromes in the Gulf Registry of Acute Coronary Events (Gulf RACE). Acta Cardiol 2009;64:439-46. 3. Alhabib KF, Sulaiman K, Al-Motarreb A, Almahmeed W, Asaad N, Amin H, et al. Baseline characteristics, management practices, and long-term outcomes of Middle Eastern patients in the Second Gulf Registry of Acute Coronary Events (Gulf RACE-2). Ann Saudi Med 2012;32:9-18. 4. Al-Motarreb A, Briancon S, Al-Jaber N, Al-Adhi B, Al-Jailani F, Salek MS, et al. Khat chewing is a risk factor for acute myocardial infarction: A case-control study. Br J Clin Pharmacol 2005;59:574-81. 5. Al-Motarreb AL, Broadley KJ. Coronary and aortic vasoconstriction by cathinone, the active constituent of khat. Auton Autacoid Pharmacol 2003;23:319-26. 6. Ali WM, Zubaid M, Al-Motarreb A, Singh R, Al-Shereiqi SZ, Shehab A, et al. Association of khat chewing with increased risk of stroke and death in patients presenting with acute coronary syndrome. Mayo Clin Proc 2010;85:974-80. 7. Ali WM, Al Habib KF, Al-Motarreb A, Singh R, Hersi A, Al Faleh H, et al. Acute coronary syndrome and khat herbal amphetamine use: An observational report. Circulation 2011;124:2681-9. 8. Cannon CP, Battler A, Brindis RG, Cox JL, Ellis SG, Every NR, et al. American College of Cardiology key data elements and definitions for measuring the clinical management and outcomes of patients with acute coronary syndromes. A report of the American College of Cardiology Task Force on Clinical Data Standards (Acute Coronary Syndromes Writing Committee). J Am Coll Cardiol 2001;38:2114-30. 9. Alberti KG, Eckel RH, Grundy SM, Zimmet PZ, Cleeman JI, Donato KA, et al. Harmonizing the metabolic syndrome: A joint interim statement of the International Diabetes Federation Task Force on Epidemiology and Prevention; National Heart, Lung, and Blood Institute; American Heart Association; World Heart Federation; International Atherosclerosis Society; and International Association for the Study of Obesity. Circulation 2009;120:1640-5. 10. Gibson CM, Pride YB, Frederick PD, Pollack CV Jr, Canto JG, Tiefenbrunn AJ, et al. Trends in reperfusion strategies, door-to-needle and door-to-balloon times, and in-hospital mortality among patients with ST-segment elevation myocardial infarction enrolled in the National Registry of Myocardial Infarction from 1990 to 2006. Am Heart J 2008;156:1035-44. 11. Poloñski L, Gasior M, Gierlotka M, Kalarus Z, Cie?liñski A, Dubiel JS, et al . Polish Registry of Acute Coronary Syndromes (PL-ACS). Characteristics, treatments and outcomes of patients with acute coronary syndromes in Poland. Kardiol Pol 2007;65:861-72. 12. Chin SP, Jeyaindran S, Azhari R, Wan Azman WA, Omar I, Robaayah Z, et al. Acute coronary syndrome (ACS) registry - Leading the charge for National Cardiovascular Disease (NCVD) Database. Med J Malaysia 2008;63:29-36. 13. Goodman SG, Huang W, Yan AT, Budaj A, Kennelly BM, Gore JM, et al. The expanded Global Registry of Acute Coronary Events: Baseline characteristics, management practices, and hospital outcomes of patients with acute coronary syndromes. Am Heart J 2009;158:193-201. 14. Baardman T, Hermens WT, Lenderink T, Molhoek GP, Grollier G, Pfisterer M, et al. Differential effects of tissue plasminogen activator and streptokinase on infarct size and on rate of enzyme release: Influence of early infarct related artery patency. The GUSTO Enzyme Substudy. Eur Heart J 1996;17:237-46. 15. Dundar Y, Hill R, Dickson R, Walley T. Comparative efficacy of thrombolytics in acute myocardial infarction: A systematic review. QJM 2003;96:103-13. 16. Budaj A, Brieger D, Steg PG, Goodman SG, Dabbous OH, Fox KA, et al. Global patterns of use of antithrombotic and antiplatelet therapies in patients with acute coronary syndromes: Insights from the Global Registry of Acute Coronary Events (GRACE). Am Heart J 2003;146:999-1006. 17. AlHabib KF, Hersi A, AlFaleh H, Kurdi M, Arafah M, Youssef M, et al. The Saudi Project for Assessment of Coronary Events (SPACE) registry: Design and results of a phase I pilot study. Can J Cardiol 2009;25:e255-8. 18. Lenzen MJ, Boersma E, Bertrand ME, Maier W, Moris C, Piscione F, et al. Management and outcome of patients with established coronary artery disease: The Euro Heart Survey on coronary revascularization. Eur Heart J 2005;26:1169-79. 19. Roger VL, Weston SA, Gerber Y, Killian JM, Dunlay SM, Jaffe AS, et al. Trends in incidence, severity, and outcome of hospitalized myocardial infarction. Circulation 2010;121:863-9.